Email grows up. Or the U.S. Senate starts to catch up. The Senate Judiciary Committee on Thursday approved a bill that would strengthen privacy protection for e-mails by requiring law enforcement officials to obtain a warrant from a judge in most cases before gaining access to messages in individual accounts stored electronically. I believe laws for email and other IT need to be updated more frequently (this law was on the books in 1986). Not as often as tech does, but it should be regularly reviewed for relvance. 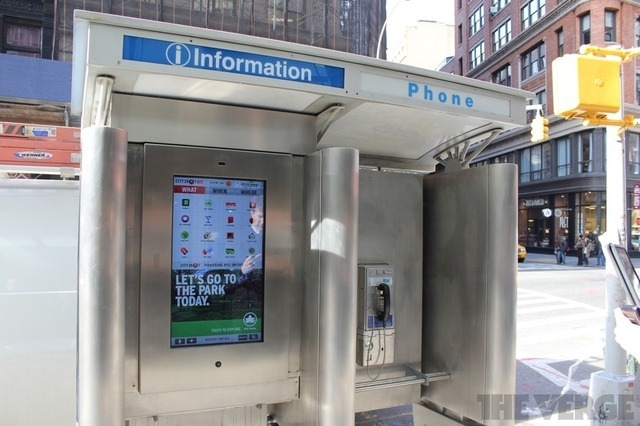 It’s good to see New York city taking advantage of existing infrastructure (pay phone pods) to make their city more digital: First of 250 internet-connected touchscreens replace pay phones in New York City | The Verge. It is not as novel as this use of the pay phone pods (How New York Pay Phones Became Guerrilla Libraries – Arts & Lifestyle – The Atlantic Cities) but it will be more useful.A great example of the city becoming a computer. It is good to see New York leading in efforts to make theirs a digital city. See also this article, More NY Subway Stations Will Get Wi-Fi, Cell Service – Personal-tech – Wireless Technology – BYTE. Digital cities need user interfaces (like the touchscreens), but they also need infrastructure (the wireless network). Now they need more APIs and other components and subsystems if they are going to truly become something users can use and programmers can program. But it’s getting there. While lots of cities will be pursuing such ideas, I think New York making progress like this will help propel alot of other cities to become more digital. 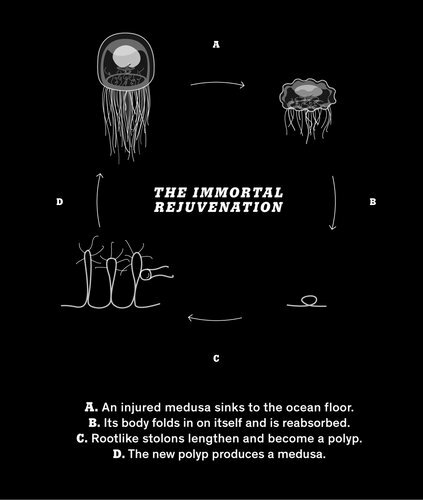 The NYTimes has an excellent article on the Immortal Jellyfish, here: Can a Jellyfish Unlock the Secret of Immortality? – NYTimes.com. Well worth a read. Maybe only Taxes are the only thing certain anymore. It seems a universal thing to slam Black Friday. And the excessive of it is a bad thing, for certain. However, here’s six reasons why it is a good things. It helps you get your Christmas shopping out of the way. It helps you save on your Christmas shopping. It helps retailers plan their year. Retail is a tough business. This helps make it less difficult. It’s forces retailers to compete for your business by offering you good deals. It’s voluntary. No one is making you go and shop. Don’t like Black Friday? Don’t go. It is very likely that Black Friday is eventually going to blow up. In Canada, Boxing Day sales (which used to happen on December 26th and are just as bad if not worse than Black Friday) have become diluted over time. Now it’s Boxing Week sales, and sales before Christmas, etc. in Canada. I expect the same thing will happen with Black Friday. In the meantime, those keen to shop and save should get out there. The rest should enjoy the season and relax and unwind. While lots of office space still conforms to cubicleland, more and more of it are looking like this: The new Google HQ in Toronto is better than your office. It’s a good article, and you should check it out to see what the new HQ looks like. 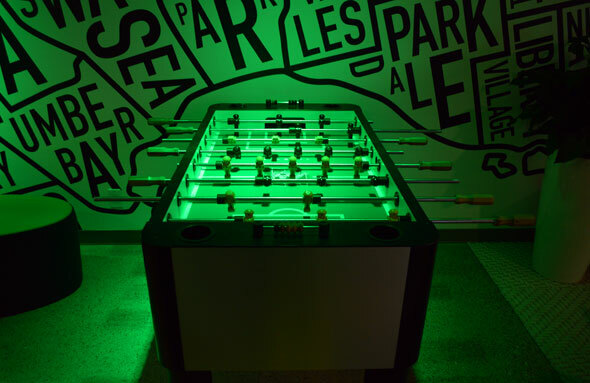 (Yes, it has the ubiquitous foosball table, but it has a nice Toronto mural on the wall). I think this is going to be the way it is or should be for offices of the future. For example, if you go and look up jobs at Medium (e.g., this one,Infrastructure Engineer — Work at Medium — Medium), you will see that they are promoting their stylish workplace at the same time they are looking for skilled people to work for them. And why not? Better work environments give companies competitive advantages when it comes to attracting talent. Even mobile work spaces like the ING DIRECT Canada Downtown Café in Toronto has a similar style to it. If you want people to work for you now and in the future, you need to provide a similar if not better work environment. This is the new vernacular for the workplace. Mobile technology is going to be going in a new direction. It will no longer need to be held by you. It will be very cheap and very mobile. You can release it into the physical world and it can go places for you and monitor or deliver things for you, as #1 shows. Instead of stalking your ex on Facebook, you can stalk them by releasing a drone to circle their yard. Want to see if someone is doing something they shouldn’t? Send a drone (or 10). The newer drones won’t continue to be as primitive as #1: they’ll be small and sophisticated. Just as handheld devices have become more and more sophisticated, so too will the new personal drones. And what will the drones use to communicate back and forth? Why the new wifi that will be built out in our cities. (See #2). People will be able to release drones onto the ground, into the air, and they will send information back via metro wifi and determine future information based on feedback from their base. Already there are primitive drone type devices for sale in electronic stores. About the only thing that will prevent drones from having more of a future will be cost or capability. But if the cost goes down, expect to see alot more drones in use and walking or flying in a neighborhood near you. What will people do with them? If they are general purpose enough, you will see all sorts of uses for personal and professional drones and robots.